Sift together the flour, salt, and baking powder. Mix the UP extra virgin olive oil and water together. Add to the dry ingredients and mix well until a dough forms. Knead on a lightly floured surface until smooth. Roll out to ⅛" thickness and then using a round glass or a large circular cutter (4"-5" diameter would be perfect), cut out rounds of dough. Fill each with 2 tablespoons of cooled filling, brush one half of the inner edge of the circle and then pinch firmly closed to form a half moon shaped empanada. 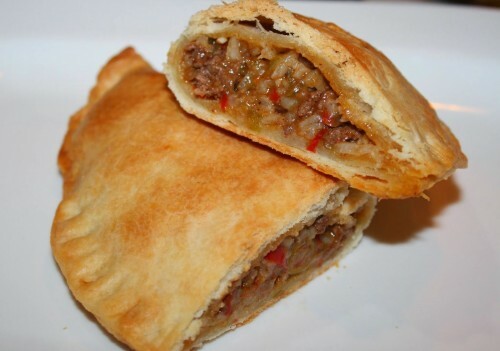 Use the tines of a fork to make a decorative edge and help seal the empanadas.